I know, not what you expected, huh?! In fact totally out there. And yet, I've been thinking about doing abstract for years and years! I just thought, for some strange reason, that it needed to be in acrylic (why? I don't know). But this is oil. What happened was - I painted a real stinker the other day (realism). And after I wiped it off I thought - I'll just play with my paint on this panel. I put down some random colors, but the further I got the worse it looked. So I wiped it off again. This time, the wipe off wasn't complete and the few colors that remained were somewhat interesting. So I put more down, and came up with this! I have no idea what the market is for this kind of work, especially since you're all used to what I normally do. So I am starting the bidding at $1. I will say, I've done a couple more since and I LOVE the process! I don't plan to stop painting what I normally paint, but I will continue to explore. Hooray for you, Carol! I've wanted to do this for a long time myself! My hats off to you! Not to worry some people like this kind of painting. I'm not quite sure what this painting is all about but for me, I imagine its like a bunch of people watching someone playing football. 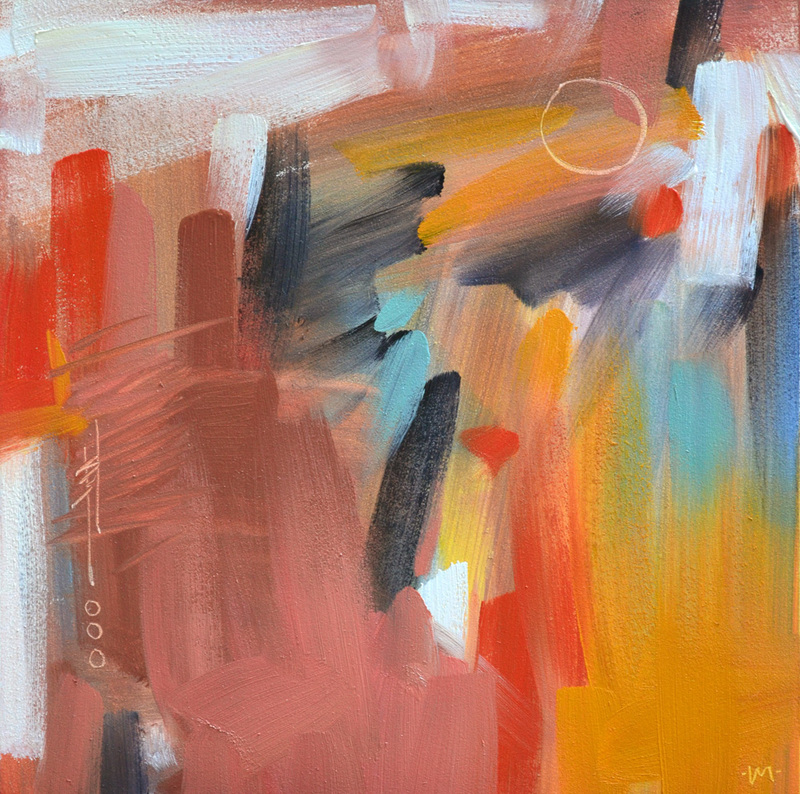 I love your 'courage' in doing this abstract painting. I too have dabbled in similar things, when a canvas has gone wrong, or even just trying it out from scratch to see where it goes. It's very liberating seeing what evolves, and makes quite a change to go out of the normal 'figurative/realistic painting comfort zone.' I look forward to seeing some more. P.S. thank you for sharing photo of Nina. I wish you lots of happy cuddling time. Good for YOU! It's fun and freeing, and you have all the basics to make great abstract art! I can feel the joy that comes from play, my friend! Have fun! I say why limit yourself, just go with it. Exploration is a good thing, as a realist painter as well, abstract work has always been a mystery to me, so Kudos to you. Nice painting. I love it Carol I cant wait to more !!! Such fun to try new things, it keeps things exciting. And so you should explore. I think you will succeed and feel really good with intuitive art. Lovely! Just forget the market for a bit and enjoy yourself. It must be refreshing for you to forget all those eyes looking over your shoulder.... Go! Carol, Looking good! I was surprised and excited to see this - I look forward to seeing how the two ways of painting inform each other! Can't agree with the others Carol. It's a nice, colourful pattern of random strokes, but doesn't require any of the enormous talent you have. I did one similar a few years ago as a protest against abstract art that was let into our Art Group...took me just under five minutes and some people even liked it. It will be interesting to see what it sells for. 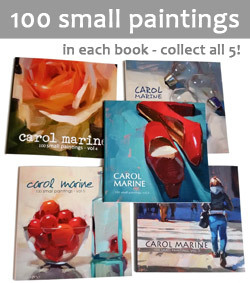 Stick to what you're BRILLIANT at - proper painting that requires talent, vision and skilful brushwork, the unmistakeable genius of Carol Marine. Leave the silly meaningless daubs to the idiots who think they can paint and the even bigger ones who buy it! That's my view anyway and if people think I'm old and stuffy, I'm happy with that - your proper work will live on and be remembered as great. Your abstracts won't. I've been told under every good painting lies and good abstract!